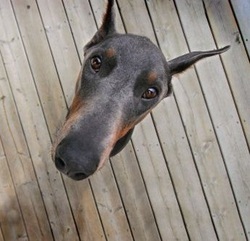 The Doberman Pinscher Club of Manitoba was formed in the early 1970's. Members are current, former, or future Doberman owners. The club promotes the responsible ownership, showing, training, and breeding of Doberman Pinschers. Naturally we’re biased, but for us, the Doberman is the Number One Breed... paws down! Nick-named “Velcro dogs”, they stick to their peeps! Balancing that well-known guardian instinct, the most loving heart and a sense of humor that will keep you laughing its whole life long. Dobermans require a calm, stable and firm pack leader, or they will assume the role for you! For more about this amazing breed, please browse our site. The Doberman Pinscher Club of Manitoba will be hosting a Doberman Pinscher Specialty in November 2017. Stay tuned...more details to come.